What made this year’s ride different for me from prior ones is that it’s the first time I’ve attempted a century (100+ mile ride) since my autoimmune disorder flared up in early 2013. The arthritic condition causes chronic joint inflammation (especially in my knees). I’m taking drugs which reduce the symptoms, but I’m still not back to “normal” (whatever that means now). Against that backdrop, I arose at an ungodly hour Saturday morning, downed food and an aspirin, and embarked on the 75-minute drive to Tellico Plains, TN. The drive down and ride preparation went smoothly. The only issue I had was that my name was missing from the list of preregistered participants. But the gatekeepers were nice enough to add it without giving me the second degree. The century riders rolled out at 7 a.m. I estimate there was 100-200 of us. It was a pleasantly cool 65F. The first 20 miles of Monroe County back roads were relaxing. Very few cars, and no chasing dogs! About 23 miles into the ride, along the four-lane stretch of Highway 411, I came upon the only cycling mishap I saw that day. A rider had crashed and had road rash on his knee. He otherwise looked OK and had several people already “helping” him, so I kept on going. Frankly, I’m surprised I haven’t seen more accidents on the Challenge over the years. There are several high-speed descents and otherwise dangerous sections of roadway on the route. It only takes a slight miscalculation or a couple seconds of inattentiveness to land one in a world of hurt in such spots. 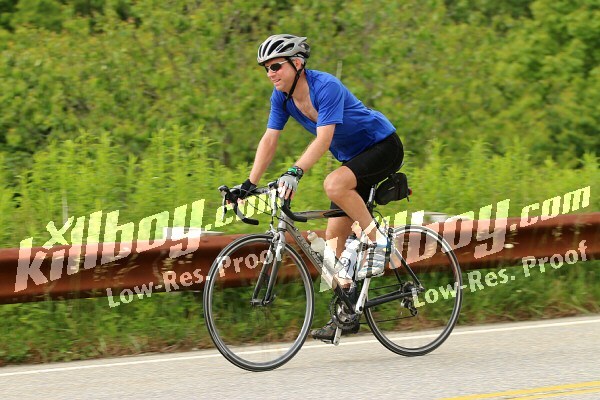 The next thirty miles were relatively quiet, for a summer weekend day. There was plenty of motorcycle traffic on the Tail of the Dragon, as one would expect, but only a few crotch rockets came zooming through. Most motorists were patient and good mannered with the slow-moving cyclists. I stopped for lunch at the TN/NC state line rest stop (mile 54). Here I saw something I’d never before seen during an organized bike ride: hot food being served mid-ride. The hosts were cooking French toast and bacon on a couple of camp stoves. I didn’t eat either one, but appreciated their effort. The food stops on the Challenge are always well-stocked and manned by friendly volunteers. I’m not a calorie counter, so I don’t know how many I consume on a day like this, but it’s a lot. Breakfast, then at least two stops (peanut butter/jelly sandwiches, bananas, grapes, chips, power bars, chocolate candy, cookies, and whatever other junk food they load on the tables) and finally a post-ride meal. If I lived this way every day I’d probably gain weight, odd as that sounds. After lunch I proceeded to the last easy section of the day: an approximately 45-minute stretch through the Cheoah River gorge. The mid-day weather was fantastic–seasonably warm with blue skies and fluffy white clouds. My gaze floated upward as I pedaled in solitude along the stream, surveying the profiles of surrounding peaks against the blue sky. To me, this is what cycling is all about: enjoying the outdoors, at one with your bike, cruising your own course (most days), at your own pace, alone with your thoughts. It’s a spiritual experience. It’s moments like this that I fantasize about when I endure riding in traffic, cold weather, rain, and other less pleasantness a year-round cyclist must face. After a water/bathroom/cool down break at rest stop #3, I followed the course into the Joyce Kilmer Forest, uphill, and along Santeetlah Lake. The solitude I encountered along the Cheoah River was just a warmup for the remoteness of this rough road. The only vehicle that passed me in five miles was the SAG (support and gear) wagon. A real contrast to the traffic I’m used to riding with around Knoxville. The biggest hurdle on a climb like this is not physical, but mental. If you dwell on the enormity of 12 miles, the ascent becomes overwhelming. The best approach I’ve found is to think not about how far you have to go to reach the top, but rather to focus on the next corner ahead, and piecemeal your way to the summit, one small victory at a time. At one point I started commanding myself to “Embrace the Pain!” And really, in contrast to chronic physical pain, or even worse, emotional pain, exercise pain isn’t bad. You can learn to like it. About five miles into the climb, cloud cover crept over. For about half an hour this cooling was a welcome development. But as I approached the 5,000 foot elevation range I started wishing for the sun again. It was only 65F at the top of the mountain (compared to 85F in the valley). Combine the cool with a breeze, a few raindrops, and residual sweat, and I was a bit chilly snacking at the Santeetlah rest stop. Most, but not all, of the last 31 miles is downhill. There is 3+ miles of climbing mixed in the descent. But if your legs have enough left in them to manage that, it’s an fun jaunt back to Tellico Plains. There are several stretches where, with minimal effort, you cruise in the upper 30s m.p.h. (or faster), around sweeping turns, watching the forest fly by. An exhilarating reward for the previous two hours of toil. How did my joints fare? I only experienced minor stiffness in my knee and hip during the latter half of the day. 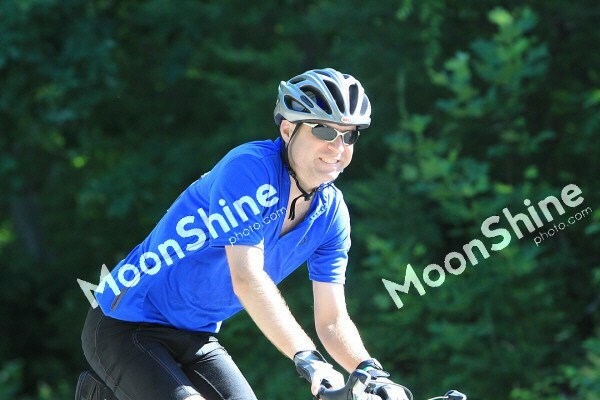 I also had a little discomfort in my side near the end of the ride, but the course was mostly downhill at that point, so I could take it easy. I passed the physical demands of the day with no painful joints, cramping, bonking, or walking in shame. I was glad the ride was 114 miles–not 124 miles–when rolled into the Tellico Plains Visitor’s Center, because I was pretty much spent. I gave a subdued wave of acknowledgment to the volunteer cheerers at the finish line and found my car, right where I left it. On the way over to the food tent I was surprised to run into an acquaintance from church, who had finished shortly before me. We chatted over pasta and rolls–more conversation than I’ve had with him in the dozen years that we’ve gone to the same church. Such is the fellowship of cycling. I lingered in the tent a good ten minutes after he left, watching the other cyclists, enjoying the summer breeze, basking in my aura of accomplishment. I savored what for me passes as an afterglow these days. I had triumphed over miles, isolation, heat, mountains . . . and now disease. The autoimmune monster hasn’t beaten me . . . yet.